Over the past year and a half since I quit my job and headed out on my first multi-month adventure, friends, coworkers, and family members have asked, “How do you do it?” This question is quite broad and it applies to various aspects of what I’ve been doing: how I saved money, how I quit my job without burning bridges, how to get all of the essentials into just one backpack, how to take care of your responsibilities back home, and how to actually get yourself around a foreign country (often solo) in one piece. So, I’ve decided to start the “Travel Tips” series in hopes that I can shine some light on these topics and hopefully make the prospect of independent world travel seem a bit less scary. Because ultimately, I want you all to join me! First things first—travel costs money. You need money. The amount of money that you will need depends on where you want to go and the type of traveler that you want to be. If your dream vacation is an all-inclusive resort stay in Indonesia, you are going to need to save more money than someone who simply wants to arrive in Lima and bus around from hostel to hostel, soaking in the culture of the country. But regardless of how much you hope to eventually save, you need to start somewhere, and that is the purpose of this post. By making a few small, yet significant, changes in my spending habits I was able to reach my savings goal in nearly half of the anticipated time. To give you an idea of the small spending changes that can lead to big savings, this post will focus on a few expenses that many of us incur: coffee, work lunches, personal upkeep (hair, nails, etc. ), cell phone, and gym membership. 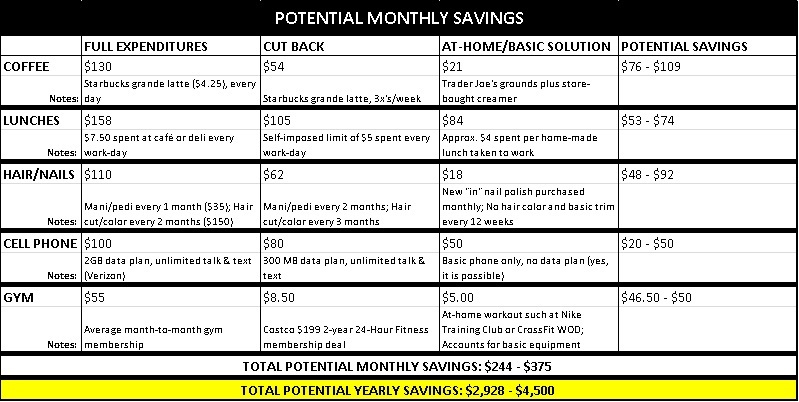 A few notes about each, in addition to a chart showing how to cut back, are outlined below. As you can see, you can save an amazing $2,928 – $4,320 per year without getting a raise, changing your 401K withholdings, or finding cheaper rent. Yowza. COFFEE: Sweet nectar of life! A morning staple for many, but that daily visit to Starbucks isn’t helping your bank account. By cutting back on the amount of times that you buy each week or by taking the plunge and making coffee at home or at your office, the savings add up quickly. WORK LUNCHES: When the lunchtime hunger pangs hit, we are often limited to the few places that are within walking distance of our desks. In my case, that consisted of an overpriced grocery store and an overpriced deli. Not ideal. By limiting myself to pre-packaged $5 meals or better yet, bringing my lunch from home, I had more change in my pocket at the end of the week. HAIR, NAILS, ETC. : We all love (and deserve) to pamper ourselves on occasion. However, monthly (or weekly) trips to the salon can leave your bank account hurting. By scaling back on the frequency of visits, or by attempting to do some treatments at home, you will see an increase in your available travel funds. Worried about what your highlights will look like if left alone? Don’t be—isn’t the growing-out look considered “ombre” these days? CELL PHONE: I admit that the prospect of being lost without access to Google Maps and unlimited text messaging is terrifying. However, having a 2GB data plan that I barely dent each month isn’t entirely necessary. Think about scaling back the amount of minutes, texting, and data to what you truly need each month (keeping in mind that nights, weekends, and common-carrier communication is often free) and you just may save a bundle. GYM MEMBERSHIP: While the gym is a place that provides respite for many, the average monthly membership fee of $55 is pretty high for what you get—a chance to sweat in close proximity to other people. Instead, consider committing to a longer-term contract that works out to a lower monthly rate, or better yet, download the Nike Training Club app (or similar) and get your sweat on at home. You will have to work around the cat that constantly tries to lay under you while doing planks, but at least that’s entertaining. ADDITIONAL NOTE – VEHICLE: While ditching your car all-together is not an option for many living outside the city, taking a closer look at how you use your car can lead to significant savings. For example, when I was driving less than 3,000 miles per year, my annual State Farm insurance dropped to under $500. By not having a car, and instead taking SF Muni and BART to get around the city and out to visit my family in the East Bay, I save around $4,500 each year (between car payments, insurance, gas, maintenance, tolls, parking permits and inevitable SF parking tickets). There’s a multi-month trip right there. There are an infinite number of ways to cut back and start saving money for your dream trip, and I hope that this post has at least gotten the ball rolling on where you can begin. Feel free to ask questions in the comments section below, or send me an email (check out the CONTACT ME tab above). Save on! © 2019 Off She Goes.